Union Chapel, just south of Highbury Corner in Compton Terrace, on the east side of Upper Street is one of Islington's most important buildings. The main Chapel is a Grade I listed building, with the rear of the building being Grade II listed. The present building is a magnificent example of Victorian gothic architecture and displays many features which were at the cutting edge of technological advance in their day, including a fine "Father Willis" organ, still in its original condition. It is also notable for its adventurous auditorium design on an octagonal ground plan, in accordance with its architect's ideas set out in his book Church Design for Congregations. The congregation first gathered in 1799 in a house in Highbury Grove as a Union of evangelical Anglicans and non-conformists, and moved to the previous building on the present site in 1806. It is a major London landmark. It was designed by James Cubitt and completed in 1877, the 170 foot tower being completed in 1889. In 1991, Union Chapel Project was formed as a charity devoted to restoring and running the building and making its facilities available to a diverse group of people. It has become an award winning music venue, regarded as one of the best places in London to experience live music. The aim of the project is to place the arts and creativity at the heart of Union Chapel and to increase access and inclusive involvement in the performing arts. It offers an independent, nonprofit making, naturally chilled-out environment, in which to experence the ultimate fusion of atmospheric high gothic surounding while enjoying your favorite artists. 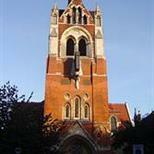 Most recently Union Chapel was voted by Time Out London readers London's No.1 Live Music Venue. Union Chapel is today a working church, an award winning venue and a centre for those homeless and in crisis in London. Venue Rules - Current England & Wales Licensing laws are strictly enforced - Ticket holder may be subject to search - Tickets are non-refundable or transferable - Venue requests no bags allowed into the venue - The venue reserves the right to change the bill without prior notification. - Ticket holders consent to any filming and sound recordings as members of the audience - Ticket holders may be subject to continuous sound levels which may cause potential damage to hearing - Ticket holders may be exposed to strobe lights - Only official merchandise is on sale inside the venue, do not buy outside. This is for your protection so that you will receive goods of proven quality. - No 'professional' type cameras, video cameras or sound recording equipment will be allowed in the venue. - Venue advises that tickets are non-refundable and non-transferable. - Venue advises only customers in possession of a valid ticket will be admitted into the venue. Lost, stolen or misplaced tickets will not be replaced. - No re-admission policy is strictly enforced - No bottles, cans, alcohol or food is to be brought into the venue - No illegal substances may be brought into or taken on the premises. Any one caught in possession of such substances will be ejected form the premises and may be reported to the Police - Any ticket holder throwing drink & objects (beer, glasses etc) will be removed from the building and no refund given. Furthermore, customer details will be provided to the regulatory authorities should an offence be alleged to have taken place. - The venue management accepts no responsibility for acts of willful endangerment, or injuries caused thereby to yourself or other patrons whilst on the premises. - No weapons. The management reserve the right to define & confiscate - No ticket monies, booking fees etc will be refunded following ejection or refused entry. - No smoking anywhere within the venue complex - at it's discretion the venue management will allow smokers out of the venue. Management reserves right to refuse admission PLEASE NOTE: Drinking on the street is prohibited in the Borough of Islington any customer found in possession of alcohol will be refused entry to the venue and possibly detained for police action. This is a Challenge 21 venue. If you are lucky enough to look under 21 you will be asked to prove that you are over 18 when you buy alcohol. If you are under 18 you are committing an offence if you attempt to buy alcohol. The Venue adopts a neighbour friendly policy so please make as little noise as possible on leaving the venue. The nearest tube is Highbury & Islington station on the Victoria line (light blue) and the overground network. Union Chapel is located just to the right, as you come out of the tube station. Angel station on the Northern line (black) is located 10 minutes walk away down Upper Street. The nearest train is Highbury & Islington station. Union Chapel is outside the Congestion zone but they encourage people to use public transport as parking in the vicinity is limited. Parking is free on the single yellow lines around the venue as follows: Weekdays - free from 6.30pm - except on Arsenal match days its 8.30pm. Saturdays - free from 1.30pm - except on Arsenal match days its 4.30pm. Sundays - Normally free all day, but has some restrictions on Arsenal match days. Arsenal match days - restrictions vary on match days so please check dates and restristions on the Arsenal FC website. At all other times they suggest using Highbury Carpark located just behind Union Chapel on Canonbury Road, which is also suitable for tour buses, vans, power etc. You can contact them in advance to reserve spaces: 0207 354 9444. DIsabled Parking - There is no disabled parking bay outside Union Chapel, but given the restirctions above this is not normally an issue. In Islington Blue Badge Holders can park for free in any pay & display and resident's parking bays, so long as you correctly display your valid Blue Badge. Please check full details on the Islington Council website. The 3 steps at the main entrance are ramped, the ground floor of the Chapel is fully accessible. The venue has 2 areas where wheelchair users can locate, - front of stage, and an area on the foyer. Please contact the venue in advance if possible, so a space can be reserved for you. Wheelchair accessible toilets are on the ground floor. The bar is accessible via a chair lift, though there is one 8 inch step as you come out of the chapel, an alternative route avoiding this step is available, please ask a member of staff if you require assistance. All of the halls at the rear of the Chapel are accessible apart from the Lower Hall, which is located on the Lower ground level. For more Access information, please call 020 7226 1686.